Most tourists only know about the terrace fields in the Northwest region of Vietnam but this place is also famous for its four large rice fields. Topping the list is the Muong Thanh field with an area of over 140 km2, in Dien Bien province. The three others are Muong Lo in Yen Bai, Muong Than in Lai Chau and Muong Tac in Son La. Located at an altitude of more than 400 m above sea level, Muong Thanh field stretches over 20 km with an average width of 6 km. In the past, it was very difficult for tourists to go to Dien Bien because of the hindrances from many winding steeps and rugged high mountain passes. In particular, the Pha Din Pass - one of the four most dangerous in Vietnam - was really a hardship that is not easy to overcome. Today with the launch of the Hanoi - Dien Bien air route, the movement becomes easier and the opportunity to explore the Northwestern region is available for any tourist. From above, Muong Thanh field stretches along the Nam Rom River, spreading out like a flower petal embracing the Dien Bien Phu monuments. Whatever the way you come to Muong Thanh, at this time in the year, you will be surprised of the beautiful natural scenery of this place. Located amid the Dien Bien basin, Muong Thanh field is like a giant "warehouse" filled with corn and rice. From late September, rice began ripening in Muong Thanh, dying the region in the yellow. 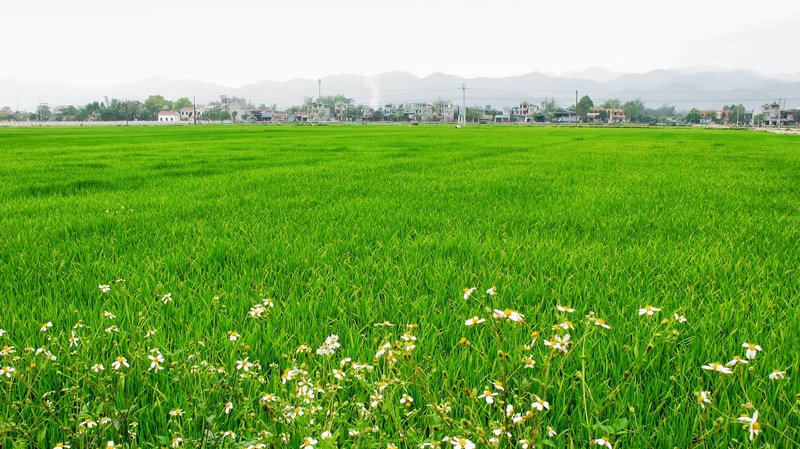 Not only famous for its vast area, with favorable farming conditions, Muong Thanh field is the home to the nationwide famous rice brand of Dien Bien. Mentioning the field of Muong Thanh, one should not neglect the Nam Rom River. From any angle, the river also appears as a blue silk line amid the broad rice field. Both sides of the river are green trees. Crossing the river is the peaceful and romantic Muong Thanh Bridge. Currently the bridge is only open for bicycles, motorcycles and pedestrians, who come here looking for a glorious past. Coming to Muong Thanh, you may be unfamiliar with the magnitude of the temperature difference during a day, usually about 5-10 degrees. 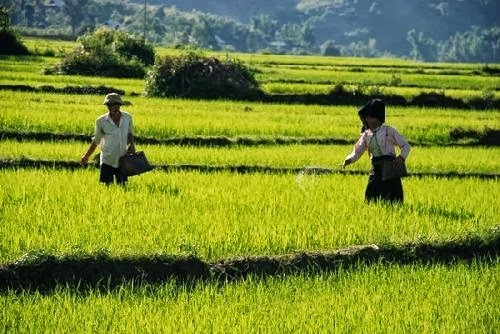 In addition, the long-lighting intensity makes people somewhat upset but these climatic conditions have contributed significantly to make the rice brand of Dien Bien. Visiting Dien Bien in the rice harvest season is the best choice because with cool weather and mild sun, you will have a great time. From Dien Bien rice specialties, many delicious dishes are prepared like sticky rice, upland rice cake, etc. Equally attractive cuisines are stream fish, bamboo shoot soup, boiled cabbage and many others, which make the journey to Dien Bien always wonderful. Sapa Homestay exploring 4 nights.